1. Tie in your thread - 8/0 brown thread. Wrapping back toward the hook bend. 2. Tie in the three pheasant tails. Divide them so they flair out to the side. 3. Tie in the ribbing material and let it hang off the back. 4. Tie a very thin piece of your back material (thin skin or swiss straw). This piece should only be about the width of 3 hook shanks. 5. Dub on your abdomen material. Try to do this sparsely, so that the abdomen is relatively thin. Wrap forward 2/3 of the way to the hook eye. To add bulk and weight to fly you can attach some lead wire by laying it in and attaching it to the sides of the hook shank. 6. Now pull the backing material up and over the dubbed abdomen and tie off. Make sure you center this on the back. Snip off the excess after you tie it off. 7. Wrap the rib forward, keeping the backing material centered on top of the hook shank. Sometimes there is a tendency for the backing material to wrap over and you rib. Tie off the rib and snip. 8. Tie in an even wider piece of Thin Skin or Swiss Straw - this is for the wing case. This piece should be about twice the width of the piece used for the back of the fly. 9. Tie in the hackle or partridge material. 10. Dub the thorax with a darker shade of dubbing (brown preferably) then used for the abdomen. Make this part of the fly puffy and very buggy. Maybe even pluck out some of the dubbing to give it an even beefier look. A good dubbing for this will have combo of softer hair and guard hairs. 11. 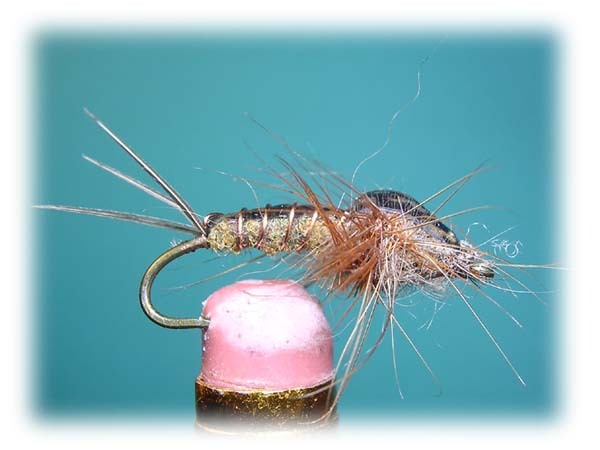 Palmer the hackle up and through the thorax and tie off. Snip the top and bottom so that the hairs shoot out to the sides. 12. Pull the wing case up and over and tie off. 13. Head cement and you are done. **this is a sweet pattern that any early season nymhper should have in their box!